of this Gilbert assisted living facility are blended into a home-from-home environment. so we include entertainment amenities that you'll find in family homes everywhere. their changing needs. Our caring team is central to that. As well as our in-home amenities and activities, it's important that our residents have a change of scene. That's why we coordinate outings to places like Organ Stop Pizza or our many beautiful parks here in Gilbert, AZ. What Makes Majestic Rose Care Homes in Gilbert Unique? 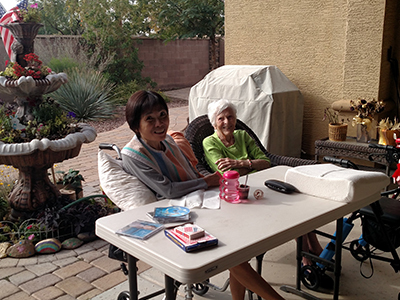 Majestic Rose care homes in Gilbert, Arizona, are assisted living residences with a difference. Our focus is on the mental, emotional and physical well-being of our residents, who we treat like family. Quality, affordable senior care in a small assisted living home with at most 10 residents doesn’t have to be dull or boring. We believe that high standards of excellence in senior care should come wrapped in a bright lifestyle…and that’s what makes our Gilbert care homes unique. Why not schedule a tour to “See the difference a majestic touch can make”! Our 24/7 care team offers supervisory, personal, and directed care, as well as offering respite, hospice and palliative care services. We have the skills to care for those with special medical needs too, such as Diabetes, Dementia, or Alzheimer’s, or those restricted to a wheelchair or bed-bound. 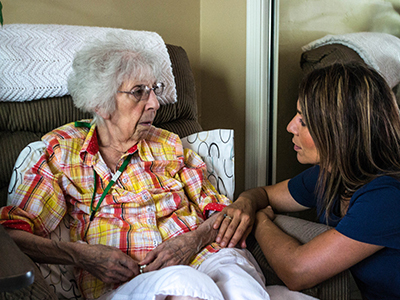 Our low caregiver to patient ratio means personal care is a given, not a possibility. Our care homes were customized for senior care from the ground up, not retrofitted to comply with state legislation after the fact. Extra wide doors, roll-in showers, discreet wheelchair ramps are just some of the features of these custom-built care homes in beautiful Gilbert, Arizona. When you combine our competitive pricing, our family approach, and our excellent nurse-led care in our custom-built homes, we believe you won’t find a better care home in Gilbert than either of our two locations. Take a more detailed look at our services for more information, or feel free to contact us with any questions. Come see the difference a majestic touch can make. Both our homes are just minutes from the 202 freeway in Gilbert AZ, easily accessible from all over metro Phoenix. Schedule a tour for you and your loved one, or resident, today. We believe the senior care we offer is second-to-none, but don’t just take our word for it; read some of our testimonials, or check out our blog to get our views on news, stories and things you should know about in the world of assisted living, care homes and senior care in Arizona. If you would like to support our residents, we will use your monetary gift to provide even more events and entertainment for their enjoyment, plus we will donate 20% of your gift to the Alzheimer’s Association – a cause that is very close to our hearts. New Changes in the Medicare system are here! Get up to date now. We know that making the decision whether to place a loved one into a nursing home, an assisted living facility or a care home is a difficult one, so please feel free to contact us with any questions you may have, or if you would like to schedule a time for a tour of Majestic Rose @ Freeman Farms or Majestic Rose @ Power Ranch. Majestic Rose care homes in Gilbert, Arizona, are assisted living residences with a difference. Our focus is on the mental, emotional and physical well-being of our residents, who we treat like family.